Only a few weeks after my last visit to far northern California, I was back for more, once again chasing down P1Ks. You'd think that with all the trouble I'd had with ticks and poison oak I might give the area a wider berth until the memory had faded. With the extra few weeks of warm weather, the lower snows have begun melting off in earnest. My plan was to stay above 5,000ft to avoid the poison oak, and hopefully the ticks as well (though I had no data to suggest ticks are less frequent above 5,000ft), which seemed to work nicely. Today's selection included two P1Ks on either side of Interstate 5 near Castella, south of Mt. Shasta. The region's monarch would feature prominently throughout the day with gorgeous views of the snow-clad behemoth of the north. 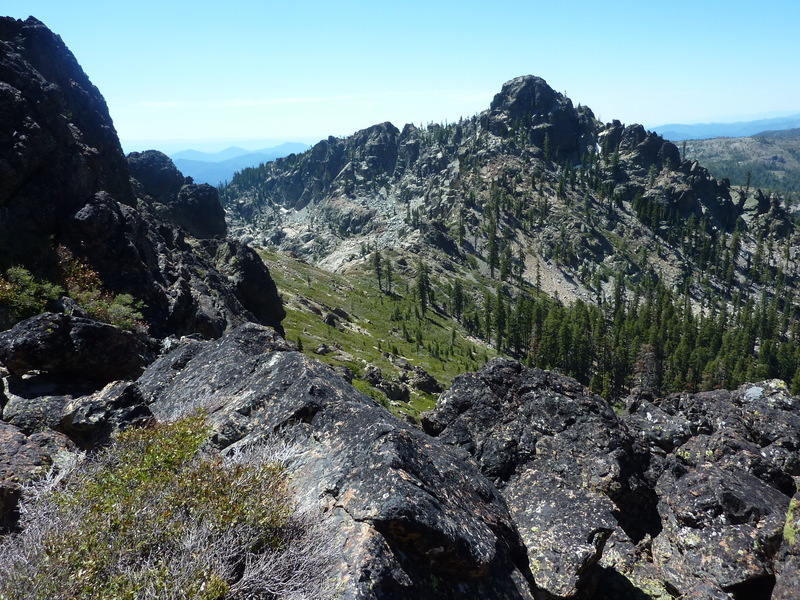 With more than 1,700ft of prominence, Grey Rocks are a striking feature south of Castle Crags. Though higher, Grey Rocks is overshadowed by the far more impressive Castle Crags. Grey Rocks can only be seen for a short stretch on I-5, catching my eye a few years ago as I was heading south. There is no info on PB or LoJ, but luckily there is a nice page on SummitPost by Bubba Suess. He describes it as a remote peak atop the Trinity Divide, but a road gets to within a mile of the summit - not all that remote, really. The paved Whalan Rd climbs from Castella at I-5, going west up the Castle Creek drainage to Whalan Summit at 5,500ft, this despite the sign near I-5 that says the pavement ends in 2.4mi (it doesn't end, but it's not maintained as much past that point - watch out for potholes). A good forest road then climbs higher to within 2mi, suitable for all vehicles. The Jeep managed to get to the end of the road just below the small, unnamed lake above 6,000ft. I did some maintenance to clear the road, but found it ended only a short distance past this. After more than five hours of driving from San Jose, I was able to start hiking soon after 10a. After I'd hiked the short distance up to the lake, I decided to take a direct route to Grey Rocks North from the northwest since it didn't look too bad from what I could see. Bubba's route goes around to the south side of the West Ridge, across a brushy slope and then up to the summit from the south and east sides, but this seemed unnecessarily convoluted. I would use much of this route on the return and found it as tedious as Bubba describes it. The Northwest route, by contrast, was quite fun. After going around the lake (the south side is far easier to navigate than the north side), one climbs up to a small meadow (which makes a temporary lake during Spring runoff), then up steeply on good (but easy) class 3 rock. I think it would be possible to improve on my route by heading directly to the North Ridge and from there to the summit, but I followed the line of least resistance that led me through a gap in the West Ridge and then up a modestly brushy gully on the south side of the ridge. It took me just over an hour to cover the 2/3mi to the higher north summit with fantastic views of Castle Crags and Mt. Shasta to the north, Grey Rocks South to the south, and the Trinity Alps in the distance to the southwest. Not finding one, I left a register here before starting down. I descended the easier slabs on the east side and then followed the ridgeline south towards Grey Rocks South, 0.4mi in that direction. This was a nice traverse, dropping about 500ft to a saddle between the two. Brush was easy enough to avoid and I took another nice class 3 route up the north side of the south summit, about 35min all told from the north summit. There is a benchmark at the slightly lower south summit and the remains of a wooden survey tower. There was no register at this summit, either, but I had no more with me to leave. My return went back down the north side of the south summit, then a traverse through forest, brush and boulders to avoid going back over the north summit. My route was pretty much along the line described by Bubba on SP, and I can't recommend it as any sort of fun with too much downfall, brush and crappy boulder fields to negotiate. I was back before 1:30p with hours of daylight remaining. I drove back down to I-5 and Castella, then up Girard Ridge Rd (paved for a few miles, then decent but not great for low-clearance after that) on the east side of the Sacramento River that cuts through the mountains here. It was after 3p by the time I'd made my way to Girard Ridge and then to the SW side of ridge's highpoint. From here, the summit is only 3/4mi away. I started on a decent trail that starts up the SW Ridge, but this soon veers over to the west side of the summit before dropping down gradually to the PCT. There is an old road cut going up the SW Ridge, easy to follow in places, heavily overgrown in others. Still, it offers the best way to reach the summit which is rounded, covered in manzanita and has poor views, despite the proximity to Mt. Shasta. There is another old cut going down the NW Ridge and I decided to follow this on a whim because I had lots of time to kill. It started well, overgrown but easy to follow, then becoming completely lost lower down in a sea of heavy manzanita. Rather than go back or continue to fight my way along the old route, I dropped down the north side of the ridge, soon escaping the manzanita, trading it for steep forest understory that eventually intersected the PCT. I followed the PCT to a trail junction, then turned left onto the Girard Ridge Trail (also called the Castle Crags Trail) which I had started on. There were some nice views to be had of Castle Crags and Grey Rocks from this trail. Easy as pie, almost, taking a bit over an hour. On my way back south along Girard Ridge, I decided to pay a visit to the Girard Ridge Lookout, about two miles southwest of the highpoint. The lookout can be rented for overnight visitors, accessed via a spur road off the main one along the ridge. A locked gate is found at the road junction, so I walked the easy 0.4mi to the lookout. I found the place deserted but the cabin unlocked with sleeping bags and other gear inside. Seems that someone was currently renting the lookout but were out somewhere else for the day, no vehicle found outside. I signed the lookout log to surprise the occupants upon their return. The cabin is nicely situated with a spectacular view of Castle Crags to the west across the Sacramento River drainage. Great Idea to carry a saw in your car. The Forest Service could use your help! Wait a minute: your a peakbagger not a trail maintenance contract worker. It looks like I have to go back now that there are registers at Grey Rocks :). I like your ascent route choice. I lost one of my dogs following Bubba's manzanita bushwhack route (or maybe my dog lost me), but fortunately found her the next day. It looks like a fun, quick jaunt if bypassing the bushwhacking.